The bowhunter education course provides training in bowhunting techniques and safety, wildlife conservation, and outdoor preparedness. Graduates receive a lifetime certification recognized by all states, Canadian provinces, and Mexico. If you were born on or after January 1, 1986 you must have successfully completed a department approved bowhunter education certification course to hunt big game with archery equipment and the certification card must be carried in the field when hunting. The Alaska bowhunter education program meets the National Bowhunter Education Foundation (NBEF) and International Bowhunter Education Program (IBEP) certification requirements. Bowhunter education classes are taught by dedicated volunteer instructors who commit valuable time and offer years of experience. The next time you have a safe and enjoyable bowhunting experience be sure to thank a volunteer. Alaska accepts the NBEF or IBEP certification cards from any State/Province sponsored bowhunter education course. Other state's bowhunting licenses, tags, stamps, age exemptions, etc. are not adequate to fulfill Alaska's requirements. 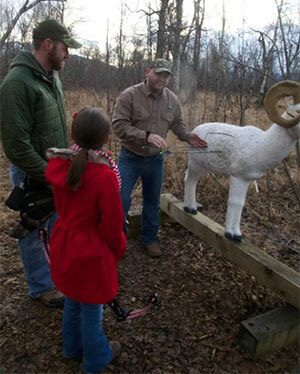 If you need a bowhunter education course before coming to Alaska to hunt big game with a bow, visit the National Bowhunter Education Foundation website for more information. For more information for each states' bowhunter education course, here is a document with their course options and website (PDF 81 kB). Please feel free to contact us if you need more assistance or have questions about the bowhunter education requirement to hunt big game with a bow in Alaska.